Sometimes it feels like it’s getting harder and harder to find the perfect contemporary bedding. If you want heritage quality it can feel a bit dated, like you’re sleeping in a museum. And if you want something more modern, too often the product is lacking the kind of quality and comfort that your everyday bedding should have. We spend a lot of time in the bedroom, roughly a third of our lives in fact, so if a tasteful modern design is what you want for your decor, we don’t think it should be that hard. You should be able to get a design that works for you with the most comfortable, durable fabrics at an affordable price. And you shouldn’t have to sacrifice any of the features you deserve to get it. That’s why for over 48 years, Schweitzer Linen has been leading the industry in making the finest contemporary bedding using the highest quality fabrics, impeccable craftsmanship and exclusive one-of-a-kind designs. It’s everything you want in bedding in the designs you want it in. Whether you’re young and just starting out or looking to wake up your bedroom environment with new energy and pizazz, contemporary bedding is a great way to refresh your look and mindset. Typically showcasing bold graphics and motifs with elegant and graceful detailing, our modern bedding sets are supremely soft and comfortable but also visually sophisticated. Upgrading the bedding in any room can give it new life and improve your everyday perspective. Adding something more contemporary can downright transform your bedroom ambience into something beautifully bright and new. Vibrant hues, unique angles and strong geometric shapes create a stunning, upscale attitude that feels instantly empowering and refined. But don’t let the modern look of our designs fool you, everything we make is still crafted with the same passion and careful craftsmanship our artisans have been using for generations, using only the best materials and paying attention to the smallest of details. When you own one of our sets, you can be sure that even the most contemporary styles are still made the way they have always been at Schweitzer Linen, the right way. If you’re looking to revitalize your bedroom style, feel more inspired every morning, or just drastically need a change, you’ll find these popular contemporary bedding collections offer some incredible options. Plus, we have hundreds of other collections on our site along with other products to make your home and life more enjoyable. Our Uffizi collection brings any room together with Italian artistry that compels thoughts of wind, tide, flow and infinite form. Luscious curls curve boldly into silky swirls of contrasting shades to add a dreamy dimension to the 300-count Egyptian cotton sateen. Available in Gray or Smoke Blue. Made in Italy. Charming and contemporary, our Ephesus collection adds a stylish presence that refreshes both body and soul. Intersecting geometric pathways cross and connect creating a precious sanctum where dreams, passions and life conjoin. 300-count damask sateen whispers promises of a peaceful nights sleep. In White or Taupe with a double hemstitch detail. Made in Italy. Straight from Italy our Cityscape design blends the natural beauty of simple shapes and lines for a contemporary look that feels upscale but never uppity. 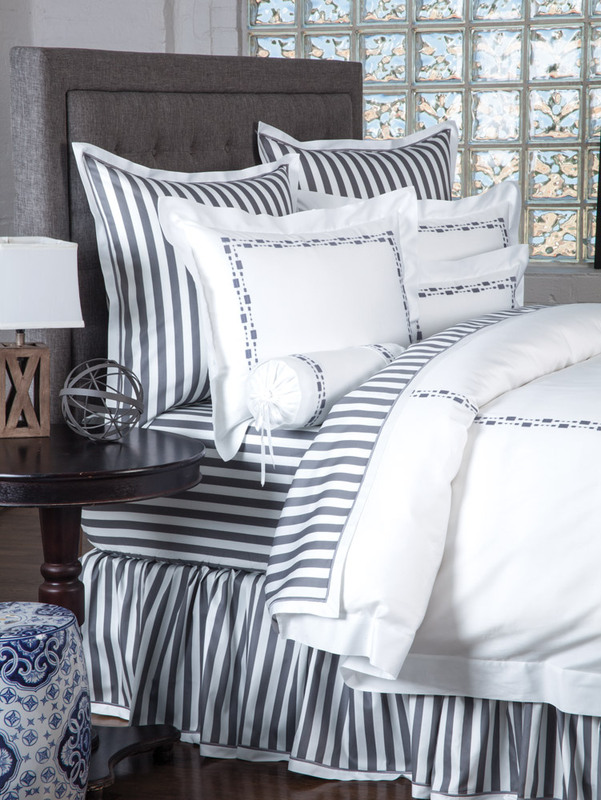 The embroidery is gorgeously displayed on pure White 300-count Egyptian cotton sateen perfectly framed by a tailored flange with invisible mitered corners. The bold, beautiful stripes in Steel Gray or Navy Blue that unify our Chesterfield collection create an ultra dramatic mood and chic modern appeal. Made in Italy of 300-count Egyptian cotton sateen with bourdon stitching and mitered corners. Let the diamond-within-diamond design of our Deco collection energize your morning and enliven your evening with beautiful bursts of modern inspiration. 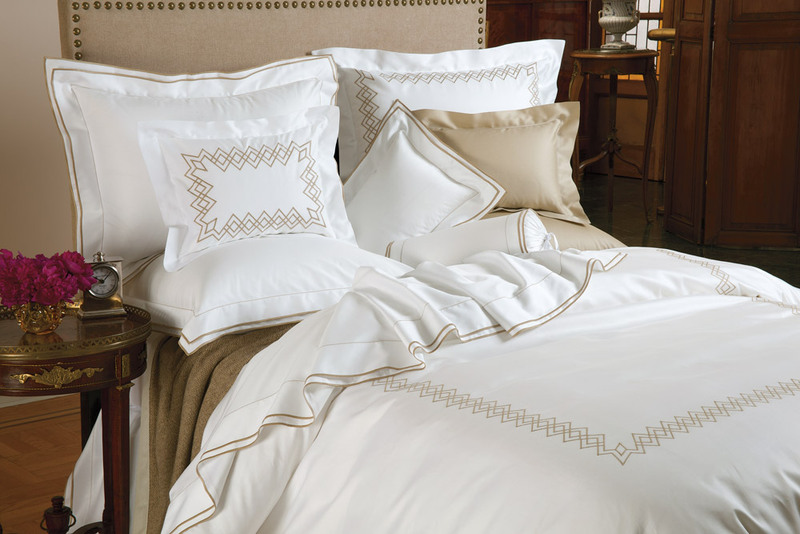 The luxe Art Deco pattern from Italy is embroidered on 600-count, 100% Egyptian cotton sateen. Available in Navy or Beige. Our Vanity collection with a double ﬂange, ﬁnished with subtle bourdon stitching, brings chic elegance to buttery soft, 300 thread count, 100% Egyptian cotton sateen. Made in Italy and available in Beige or Navy on White. 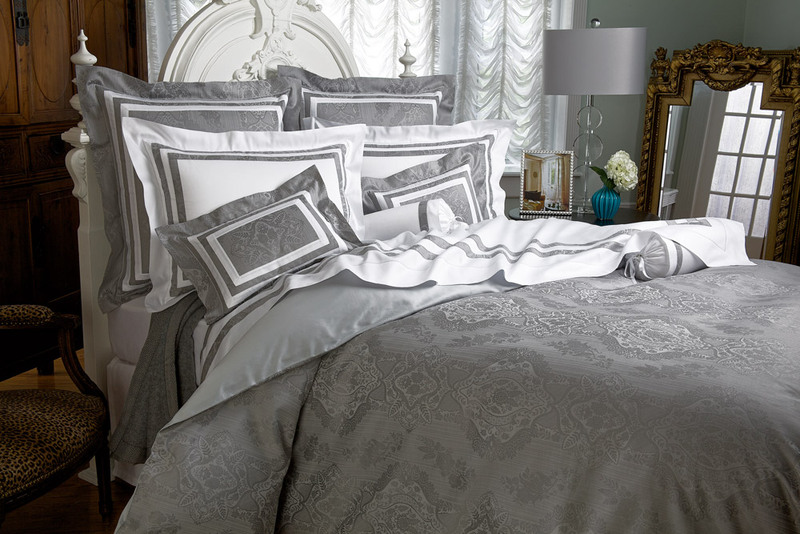 Sumptuously chic and elegant, the Leopardi collection boasts a 500-count damask Egyptian cotton sateen, woven with voluptuous floral medallions in shimmering Grays. Solid White 600-count sateen. Flat sheets, neckrolls, king and standard shams are solid white with damask inserts. Boudoir and Euro shams are damask with solid white inserts. Duvet covers reverse from damask to a solid gray. Made in Italy. Overlapping embroidered circles in the geometric design of our Avon collection create the calm, cool, modern bedroom you’ve been waiting for. The finest Italian tailoring is on display with knife-edged flanges and mitered corners. 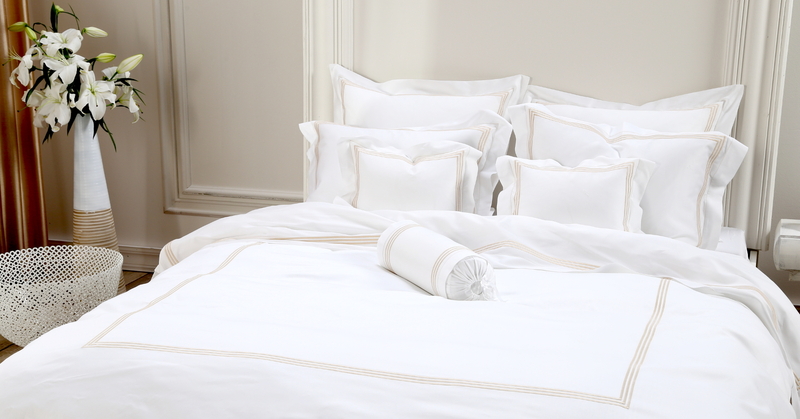 Imported, with Beige and Ivory embroidery, on pure white 600-count Egyptian cotton sateen. If modern decor is about simplicity, beauty and personalization, our Hampton Court collection has perfected it. Clean, crisp, three line embroidery is underlined with a narrow zigzag finish and flanged for simple elegance. Pure White, 300-count Egyptian cotton sateen from Italy is available in Beige, Blue, White, Gray, Yellow, Pink, Peach, Black, Hunter Green, Red, Navy, Burgundy, Navy/Yellow/Navy, Green/Orange/Green on White or Dark Gray on Light Gray or Beige on Ivory. Other, custom, colors of embroidery or Sateen are available too as well as matching Blanket Covers and Shams in a beautiful texturized piqué.